Until 1 January 1801, interplanetary space between Mars and Jupiter seemed empty, puzzlingly so, because the Titius-Bode rule (Section 1.4.3) had indicated the existence of a planet about 2.8 AU from the Sun. Therefore, a systematic search for the 'missing' planet was started in 1800 by 12 German astronomers. On 1 January 1801 the missing planet was discovered, not by a member of the German team, but by the Italian astronomer Giuseppe Piazzi (1746-1826) during routine stellar observations at Palermo. The new body was called Ceres, and though it was close to 2.8 AU from the Sun (2.766 AU today), it was regarded as disappointingly small. The modern value of its radius is 479 km - about a quarter that of the Moon. The German search therefore continued, and by 1807 had revealed three further asteroids: Pallas (at 2.772 AU), Juno (at 2.668 AU), and Vesta (at 2.361 AU). Each of these bodies is much smaller than Ceres, which is by far the largest asteroid (Table 1.3). Even the larger asteroids are so small that in nineteenth-century telescopes they looked like points, as did the stars - 'asteroid' means 'resembling a star'. Alternative names are 'minor planet' and 'planetoid'. Now, we can see the largest asteroids as extended objects, and spacecraft have visited several. We can also detect very small ones, down to less than 1 km across. At a size of the order of 1 m there is a somewhat arbitrary change in terminology, smaller bodies being called meteoroids. At sizes below a few millimetres we have micrometeoroids, and below about 0.01 mm we have dust. Modern catalogues list over 20 000 asteroids that have had their orbits accurately determined. These tend to be the larger bodies. Table 1.3 lists the orbital elements of the largest 15. Over 100 000 more asteroids have been seen, but have not had accurate orbits established. Overall, we have probably seen all of the asteroids greater than 100 km across (238), but only a tiny fraction of the small ones - it is estimated that there are about 109 with sizes greater than 1 km. The smaller the size, the greater the number, but the total mass of all asteroids is dominated by the largest few. If an estimate of the order of 1022kg for the total mass of the present-day asteroids between Mars and Jupiter is correct, then Ceres accounts for about 10% of this total. It is estimated that so much mass has been lost since the birth of the Solar System that a few times 1025kg must have been present initially between Mars and Jupiter. The Earth's mass is 6 x 1024kg (to one significant figure), so if there had been substantially less mass loss, Mars would have been more massive and there would have been one or two more terrestrial planets beyond Mars. In Chapter 2 you saw that the asteroids are thought to be derived from the planetesimals and embryos that were in the space between Mars and Jupiter. Jupiter prevented the build-up of a major planet in this region, and scattered much of the material to other regions. Interactions between the asteroids and Jupiter have continued, and also between the asteroids themselves. This has resulted in considerable fragmentation and reduction of the asteroid mass over the 4600 Ma history of the Solar System. Figure 3.1 shows the distribution of the semimajor axes of the orbits of the asteroids. You can see that the great majority of values lie in the range 1.7-4.0 AU, with a particular concentration in the range 2.2-3.3 AU. The asteroids with semimajor axes in these two ranges constitute respectively the asteroid belt and the main belt. The orbital inclinations in these belts are fairly small, with few values above 20°, so the asteroids are part of the prograde swirl of motion in the Solar System, though on the whole the inclinations are larger than those of the major planets' orbits. The orbital eccentricities are also somewhat larger, with values of 0.1-0.2 being typical. □ If the semimajor axis a of an asteroid's orbit is 3.0 AU, and the eccentricity e is 0.30, what are its perihelion and aphelion distances? From Figure 1.7 (Section 1.4.1), the perihelion distance is (a - ae), which is 2.10 AU, and the aphelion distance is (a + ae), which is 3.90 AU. This shows that a main belt asteroid even with an atypically large orbital eccentricity does not stray from the space between Mars and Jupiter. Figure 3.1 also shows that the semimajor axes are not distributed smoothly. A prominent feature is the Kirkwood gaps, named after the American astronomer Daniel Kirkwood (18141895) who first detected them. These gaps are semimajor axis values around which there are few asteroids (because of orbital eccentricity it does not follow that these are depleted zones in space). They correspond to mean motion resonances (mmrs) between the asteroid and Jupiter. Figure 3.2 The 3:1 mmr of an asteroid with Jupiter. Figure 1.14 illustrates the 2:1 resonance. Figure 3.2 illustrates the 3:1 mmr, in which an asteroid would orbit the Sun three times whilst Jupiter orbited the Sun once, i.e. the orbital periods are in the ratio 3:1. 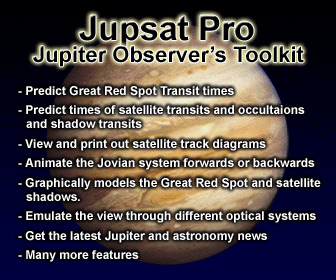 This means that if Jupiter and the asteroid are lined up, then three orbits later the line-up is exactly repeated. The periodically repeated alignments make many resonant orbits unstable, leading to an increase in eccentricity that might be abrupt and large, characteristic of chaotic behaviour. 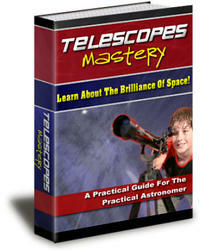 This results in the asteroid crossing the orbits of one or more of Mars, the Earth, and Jupiter. There is then a high ejection probability within a time of the order of only 0.1 Ma. In Figure 3.1 the Kirkwood gaps are particularly noticeable at the mmrs 4:1, 3:1, 5:2, 7:3, and 2:1. Simulations show that at the 2:1 mmr the removal process is inefficient, and so the depletion of asteroids here might owe something to the original distribution of matter in the asteroid belt. The dearth of asteroids beyond 3.3 AU, which defines the outer edge of the main belt, can be explained by present-day resonances, plus an inward migration of Jupiter by a few tenths of an AU early in Solar System history (Section 2.2.5), which would have swept mmrs through this region. Close to Jupiter asteroids have been removed by one-shot processes, capture, or scattering, as can be performed by any planet. The location of the inner edge of the main belt near 2.2 AU seems also to be the result of Jupiter's gravity, though in this case orbital resonances are not involved. In a few cases, resonant orbits have an excess of asteroids. In Figure 3.1 the 3:2 resonance with Jupiter shows just this effect, the corresponding asteroids constituting the Hilda group. A factor that helps explain why they have not been removed by Jupiter is that when the Hilda group have Jupiter near opposition they are near perihelion, and so close approaches are avoided (cf. Figure 1.14). Another feature of asteroid orbits is grouping into families. The members of a family have similar semimajor axes, orbital inclinations, and eccentricities. In the early years of the twentieth century the Japanese astronomer Kiyotsugu Hirayama (1874-1943) discovered several such families, now called Hirayama families. Each family typically has several hundred known members. The orbital similarities within each family indicate that the members are the colli-sional fragments of a larger asteroid. 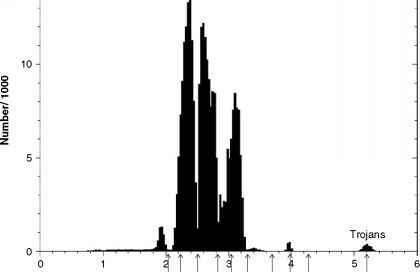 This view is supported by the similar reflectance spectra (Section 3.1.6) observed across the members of most families, spectra that are distinct from those of other families. It is estimated that more than 90% of the asteroids in the asteroid belt are in families. Major collisions, including the sort that produce families, are thought to be occurring once every few tens of million years on average. One outcome is that at least one of the two bodies involved in the collision reassembles as a gravitationally bound rubble pile, with a low density. Another outcome is that small fragments provide some asteroids with small satellites, e.g. Ida has the tiny Dactyl. A few thousand asteroids are known to have orbits with semimajor axes outside the range 1.7-4.0 AU. They thus lie outside the asteroid belt, and several interesting groups have been identified. As their name suggests, near-Earth asteroids (NEAs) are asteroids that get close to the Earth. Some even share the Earth's orbit, each one with a distance from the Earth along the orbit that oscillates over a large range. Collisions between NEAs and the Earth cannot be ruled out. Over 600 NEAs are known, and various estimates based on this population put the total number up to several thousand greater than 1 km across. Of those discovered, 1950DA has the greatest chance of hitting the Earth. This would occur on 16 March 2880, but only with a 0.3% probability. This NEA's direction of rotation is unknown, but if the sense is opposite to that of the orbit, then the Yarkovsky effect will reduce the strike probability to zero. 80 km across, thankfully lightly populated. The body is estimated to have been 50-75 m across and broke up in the atmosphere in a huge explosion. The average time between such encounters is estimated as roughly 1000 years. To reach the ground intact an asteroid would have to be considerably larger, depending on its composition. An intact body around 200 m across is a 1-in-100 000 year event, on average, perhaps less often, but would cause a global climate catastrophe, threatening human civilization. A famous big hit was 65 Ma ago, when an asteroid 10-14 km across fell in Yucatan, and probably put enough debris into the atmosphere to cool the Earth to the extent that contributed to many species dying out, including all the dinosaurs. Each NEA belongs to one of three well-known groups, each taking its name from a prominent group member. The Amors have semimajor axes greater than 1AU, but perihelion distances between 1.017 AU and 1.3AU. □ What is the significance of 1.017 AU for the Earth's orbit? This is the aphelion distance of the Earth. The Apollos have perihelia less than 1.017AU, so, if their orbital inclinations were zero, orbits with aphelia larger than Earth's perihelion distance of 0.983 would intersect the Earth's orbit. Even with non-zero inclination, intersection occurs if the ascending or descending node intersects the Earth's orbit (Section 1.4.2). The Atens have semimajor axes less than 1 AU. With non-zero eccentricity intersection with the Earth's orbit can occur. Through the influence of the terrestrial planets, the orbital elements of the NEAs vary, and therefore most of them will collide with the Sun sooner or later, and others will collide with the Earth or with another terrestrial planet. It is estimated that the average orbital lifetime is only a few million year. This is very short compared with the 4600 Ma age of the Solar System, so replenishment must occur. The asteroid belt is undoubtedly a major source, the 3:1 orbital resonance being particularly copious. Comets are another source too, as you will see (Section 3.2.1). The Trojan asteroids share Jupiter's orbit-they are in a 1:1 mmr with Jupiter. Figure 3.3 shows where the Trojan asteroids are concentrated. Over 1000 are known, the largest being Hektor, 330 km by 150 km. There are probably more than 1000 very small ones yet to be discovered. The total mass is estimated to be of the order of 1021 kg, about 0.01% of the Earth's mass. The Trojans cluster around two of what are called the Lagrangian points of Jupiter and the Sun. Figure 3.3 shows all five of these points, labelled L1-L5. They are named after the Franco-Italian mathematician Joseph Louis Lagrange (1736-1813), who predicted their existence. They arise in a system of two bodies in low-eccentricity orbits around their centre of mass plus a third body with a much smaller mass. The five points are where the third body can be located and remain close to that position relative to the other two. Thus, the whole configuration can be thought of as rotating like a rigid body about the centre of mass. Regardless of the ratio of the masses of the two main bodies, the points L4 and L5 are located as shown in Figure 3.3. By contrast, the locations of L1 and L2 do depend on the mass ratio, and lie closer to the less massive body. For the remaining point, if, as in the case of the Sun and Jupiter, the mass of one of the two bodies is much greater than that of the other, then L3 lies very close to the orbit of the less massive body. The positional stability of a small mass placed at L1; L2, or L3 is poor, but at L4 and L5 it is much better. Objects at L4 and L5 need not remain exactly at the point, but can follow orbits around it. It is at L4 and L5 that the Trojans cluster. Figure 3.3 The five Lagrangian points with respect to Jupiter and the Sun, and the Trojan asteroids. There is a handful of small bodies known with orbits that lie among the giant planets. The first of these to be discovered, Hidalgo in 1920, is a body about 15 km across, in an orbit with an inclination of 42.5°, and so eccentric that it extends from 2.01 AU to 9.68 AU from the Sun. □ What is Hidalgo's semimajor axis? This is (9.68 AU + 2.01AU)/2 = 5.85 AU (Figure 1.7). Its highly eccentric, highly inclined orbit suggests that it might be the remains of a comet nucleus (Section 3.2.4). Small bodies with perihelia greater than that of Jupiter's semimajor axis (5.2 AU) and semimajor axes smaller than that of Neptune (30.1 AU) are called Centaurs. The first Centaur to be named as such was Chiron, discovered in 1977. It is about 180 km across, and ranges from 8.46 AU to 18.82 AU from the Sun. However, Chiron has low surface activity suggestive of a comet, so it is classified both as an asteroid and as a comet. In 1991 Pholus became the third asteroid to be discovered beyond Jupiter, in an orbit that takes it from 9AU to 32 AU. It is also about 180 km across. A few tens have since been added to the list, ranging in size down to a few tens of kilometres. At such large distances from us, bodies smaller than this are difficult to discover - it has been estimated that there are a few thousand Centaurs greater than 75 km across. Several Centaurs are known to have (weak) surface activity. Calculations indicate that their lifetime as Centaurs is about 1-10 Ma (perhaps 100 Ma in some cases) before they suffer huge orbital changes. Computer simulations show that their source is the E-K belt, from which they are drawn by the gravitational influence of Neptune. In this case they are icy-rocky in composition. Over about 1-10 Ma (perhaps 100 Ma) a Centaur will suffer a huge orbital change, resulting in its ejection from the Solar System or a reduction of its perihelion to the point where the Sun evaporates its ices and it becomes a short-period comet (Section 3.2.1). Clearly, the Centaurs blur the distinction between asteroids and comets. They are probably best regarded as a population transient between the E-K belt and the short-period comets. 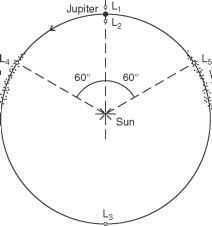 (b) discuss whether any of the 15 could be at the Lagrangian points L4 or L5 of the Sun plus any planet. With few exceptions, the asteroids are too small and too far away from the Earth to be seen as anything other than points of light in the sky. The exceptions include the largest few asteroids, a handful of NEAs, and a few that have been imaged from close range by spacecraft. Their sizes are thus known from direct observations. In addition, a dozen or so have passed between us and a star, the size then being obtained from the accurately known rate at which the asteroid moves across the sky, and the length of time for which the starlight is blocked. For the great majority of asteroids, sizes have to be obtained by indirect means. An important indirect method depends on the measurement of the flux density of the reflected solar radiation that we receive from the body. Flux density F is a general term defined as the power of the electromagnetic radiation incident on unit area of a receiving surface. Our receiving surface will be perpendicular to the direction to the asteroid, and F spans the wavelength range of the whole solar spectrum. where k is a combination of known factors involving the Sun and the distance to the asteroid, A is the projected area of the asteroid in our direction (Figure 3.4(a)), and p is a quantity called the geometrical albedo. This is the ratio Fr (0)/FL(0), where FL(0) is the flux density we would have received from a flat Lambertian surface perpendicular to the direction to the Sun and Earth, and with an area equal to the projected area of the asteroid (Figure 3.4(b)). A Lambertian surface is perfectly diffuse (the opposite of a mirror) and reflects 100% of the radiation incident upon it. It is reasonable that Fr (0) increases with p and also with A.